Use TB2QA89 to reference this item. Please note if you are in possession of this coin, you are in possession of stolen property. This geocoin was meant to travel from cache to cache, not to remain in one's possession. If you come across this coin in your travels please contact me or log it accordingly. If you are unsure how to log please contact me through my geocaching profile. 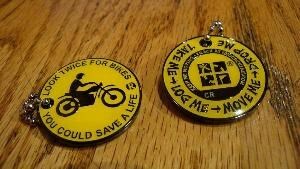 Remember all bikers who are fallen in traffic and look out for them who are still riding. Look out for bikers........and......... Bikers look out for cachers. Beim 8. Stammtisch OWL gesehen. heute vom 8. Stammtisch OWL von einem nicht Biker gesehen und mitgenommen.